Difference between revisions of "Smartlists"
The easiest way to create and modify Smartlists is with the Search Wizard. This dialog allows you to create a Search using a graphical interface that makes it easy to define your search with pre-filled drop-down menus. The easiest way to create and modify Smartlists is with the [[Search Wizard]]. This dialog allows you to create a Search using a graphical interface that makes it easy to define your search with pre-filled drop-down menus. You can also right-click on the Smartlist in the [[tree]] and choose ''Edit Smartlist''. You can also right-click on the Smartlist in the [[tree]] and choose '''Edit Smartlist'''. 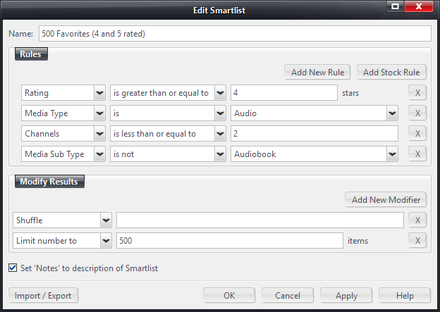 An example of a Smartlist open in the Smartlist Editor. In addition to manual Playlists in Media Center, you can create Smartlists. A Smartlist is essentially a saved search. Unlike Playlists, you do not add specific items in a particular order, but instead define a set of rules that Media Center will use to dynamically update the playlist each time you open or refresh it. For example, a simple Smartlist can be created to select songs added to the Library within the last 10 days. Or you could create one that says: Select everything in my "Top 40 hits of 1989" Playlist except for the Christmas songs and the songs by Aretha Franklin. Smartlists can also include Modifiers that shuffle the results, mix them in specific percentages, sort the results, and a wide variety of other capabilities. Whenever you open, refresh, or play a Smartlist, it will apply the search to your entire Library, so it will always include the newest changes in your media files and metadata. Smartlists can be created for all Media Types: music, video, images, documents, and even a mixture of all of them. Smartlists are stored in Standard View's Tree under the Playlists item. Smartlists are a special kind of playlist marked with , and can be filed into any Playlist Group. To move a Smartlist from one Playlist Group to another, simply drag its icon in the Tree and drop it where you'd like it to move. Media Center will ask if you'd like to move or copy the smartlist. You can copy or edit any of the default Smartlists, by right-clicking on them and choosing Edit Smartlist. You can also create your own. You can also right-click on the Smartlist in the tree and choose Edit Smartlist. The Import/Export button in the Search Wizard opens a dialog that allows you to type the query for the Smartlist in using Media Center's Search Language. This allows you to easily copy and paste text into the box to allow you to quickly import Smartlists from other users or locations. You can also save and load the rules from text files. Here are some examples that you can paste into the Import/Export box to get an idea for how the system works. Selects first all audio files, then limits to 100 songs. Selects all files which has a import date newer than 31 day, and then sorts the list after the imported date. Remove songs longer than 8 minutes. Use it when syncing with devices. This may remove those hidden track songs with extensive silent periods. Limits smartlist to be maximum 1000 MB. Use it to set a desired total smartlist size, when syncing with devices. This is a bit more advance, but should be understandable. The mix is a very handy function for combining selects (or playlists and other smartlist for that matter). Each comma, seperates the operators. The first value defines the number of items to select in total. Next, one define the amount to select for the following query. It can be added as many querys as one likes in the mix. Here, to querys are added, one for selecting 50%(150 songs) rated 5, and the other 50%(150 songs as well) rated 4 or 5. Select the 20, rated 5 songs, which had the longest time since been played. Select randomly up to 1000 songs with rating 3 or higher (with higher density of higher rated songs), but 25% of them unrated. Remove duplicates. Select up to 20 songs from different artist, with focus on newly released and imported music, but also some old classics. Users of Media Center have created almost every kind of Smartlist imaginable, from complex searches built on MC's Expression Language to simple tools for one specific task. Look through the following collection for some examples of how to get started. If you need help or want further examples, drop by and ask on Interact. A smartlist operates from left to right, just as the selection line was written. Use Caution when editing Smartlists that contain references to other playlists while serving your Library via Media Network.